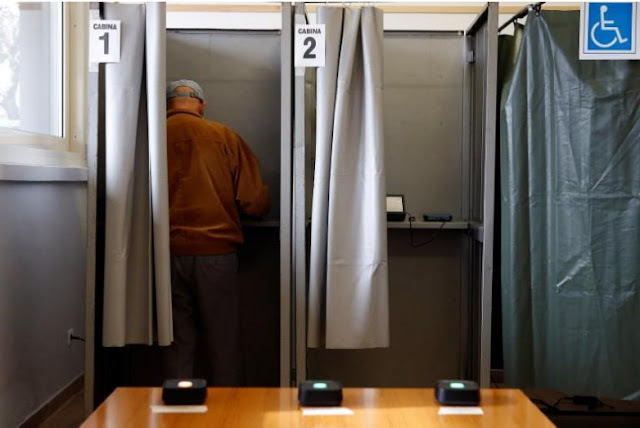 A person casts his electronic vote for Lombardy's autonomy referendum at a polling station in Lozza near Varese, northern Italy, October 22, 2017. MILAN - Two wealthy regions of northern Italy began voting on Sunday in referendums for autonomy, ballots that could fan regional tensions in Europe at a time when neighboring Spain is striving to prevent Catalonia from breaking away. Lombardy and Veneto, regions that are both run by the once openly secessionist Lega Nord party, are holding non-binding votes which the party hopes will deliver it a mandate to negotiate better financial deals from Rome. Unlike the Spanish region of Catalonia, which held an independence referendum on Oct. 1 despite it being ruled unconstitutional, the Italian referendums are within the law. Like Catalonia, Lombardy and Veneto complain they pay far more in taxes than they receive. Lombardy, home to financial hub Milan accounts for about 20 percent of Italy’s economy - the euro zone’s third-largest. Veneto, which includes the tourist magnet Venice, accounts for 10 percent. “Lombardy and Veneto have two efficient administrations and public services work well, much better than in other Italian regions ... this is why I think it is worth asking for greater autonomy,” said Massimo Piscetta, 49, who voted “Yes” in a small town outside Milan. Lega Nord was established in the 1990s to campaign for an independent state of “Padania”, stretching across Italy’s north, from around Lombardy in the west to Venice in the east. It no longer campaigns for secession but argues that taxes the north sends to Rome are wasted by inefficient national bureaucracy. The referendum results are not binding, and some of the Lega’s political opponents say it is a waste of time and money. Under Italy’s constitution, regions can enter into negotiations at any time with Rome to take on more functions from the center. “I am not going to vote because I think this referendum is useless, expensive, ambiguous and unfair,” said Giovanni Casolo, 54, expressing concern that the text of the Lombardy referendum did not spell the areas where the region wanted to increase its autonomy. Lombardy’s leader, Roberto Maroni, says a strong victory for “Yes” would give him a mandate to bargain hard in Rome. “It’s obvious that the more negotiating power I have, the more money I can manage to bring home,” Maroni told Reuters in the run-up to the referendum. Lombardy alone wants to keep an additional 27 billion euros ($32 billion) of its own taxes. Political experts say neither region is likely to succeed in wresting much money away from the central government without causing problems for regions in Italy’s poor south. Giovanni Orsina, history professor at Rome’s Luiss-Guido Carli University, said a strong “Yes” vote could deepen the old north-south divide which dates back to before Italian unification in the 19th century. “Once you open up the issue of what the northern regions pay, then I expect a backlash in southern Italy,” he said. Two wealthy regions of northern Italy began voting on Sunday in referendums for autonomy, ballots that could fan regional tensions in Europe at a time when neighboring Spain is striving to prevent Catalonia from breaking away.